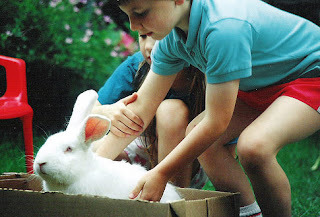 How To Teach Your Children The Proper Care For Your Pet Rabbit! Children are naturally innately drawn to cute, cuddle-y little creatures, and they will probably want to pick up, stroke and play with your new pet rabbit. But while this may be tempting, it's potentially quite dangerous -- both to the bunny and to your child. Rabbits are sociable animals and generally like human companionship, but unlike dogs and some cats, they do not enjoy the same type of close contact. They are ground-dwelling creatures and prefer to have all they're legs on the ground. If your child tries to pick up your new pet, the rabbit will likely squirm, claw and perhaps even fall to the floor. Moreover, children may want to rough-house with their new pet, but rabbits can easily be harmed by such behavior, because their bodies are so fragile. For all these reasons it is essential to teach children in advance about what to expect from their pet and how to treat their new fuzzy friend. Read the next chapter, which is all about understanding handling your new rabbit, and then sit down for a talk with your kid or kids. Explain that rabbits are not like other pets, and that they don't like being picked up. Also, be aware that rabbits do not respond well to stressful or very noisy environments, so households with very hyperactive or very loud children may just not be suitable to a pet bunny. And if you have a particularly energetic young child, you should certainly supervise the child's playtime with the rabbit, so that you can affirm good behavior and correct bad habits. Make sure that you have enough of those essential supplies on hand before you bring your rabbit home, so that you don't have to run out and buy supplies while you're in the midst of getting your new pet settled into your house.